Today is day two of the September 2012 Hydra Blog Hop and my guest is author Dianne Gardner, author of Deception Peak, Book I of the Ian’s Realm Saga. To start things off, I asked Dianne some quick questions so we could get to know her better. Can you tell us a bit about your novel? What genre is it? Sounds epic. What was the hardest part about writing Deception Peak? What was the easiest? Deception Peak was actually conceived as a prequel to a book I had written in order to explain the world, the magic, the power of the Songs of Wisdom, and the people who live in the world. However, by the time Deception Peak was finished, I had to rewrite the second book– so in a sense that was the most difficult part of writing it. The easiest was developing the characters, and describing the countryside because the landscape is so much like the places I’ve lived and visited. Sounds like all your hard work paid off in the end. Would you describe yourself as a plotter or a pantser? I’m definitely a plotter. I believe that there should be a form to storytelling, a foundation to your plot if you will. Being also a portrait artist by profession I can relate the process of writing to that of painting. I begin with an abstract. In painting, that’s blocking in shapes and in writing it’s an outline. But even before I get that far, I need to study my reference material and make decisions. I need to plan the composition, design, and most importantly I decide what are the most beautiful parts of the portrait that I need to emphasize? So it is with writing. What is the theme? What heartstrings will be tugged at in this story? I admire anyone who can be creative with paint. I draw crooked stick people only because I could never draw a straight one. What sort of moral code is featured in your novel? Ian, my main character is a teenager who’s been missing a lot in life because of the trauma of losing his mother when he was young and being raised by a father who’s a good man, but is still overcoming his own grief. Ian puts his Dad on a pedestal and it takes the Realm to make him realize that Dad can’t live up to Ian’s expectations. Throughout the trilogy, Ian’s experience in the Realm teaches him what a true family is and how he has a responsibility to others. What sort of creatures do you include in Deception Peak? The most ominous creature in the Realm is Old Stone Heart-Stenhjaert as the natives call him. You don’t see him a lot, but his presence is like a cloud hanging low over the mountain, haunting and fearful. One of the tribes of the Realm revere him as master, the other seeks to annihilate him. There’s also a little computer character that Ian had made long ago who comes to life. He makes a cameo appearance in Deception Peak, but you might see much more of him later in the series. As long as the Paper Clip guy from Microsoft Word doesn’t make an appearance… If you could have a discussion with any author (living or deceased), who would you choose and why? I would love to talk with C.S. Lewis. The man was brilliant not only in his logic and thought processes, but in his ability to stay youthful. I think I could just sit at his feet and listen to him talk about anything. I would have loved to have met him in person! Excellent choice. The Chronicles of Narnia is an all time favorite. 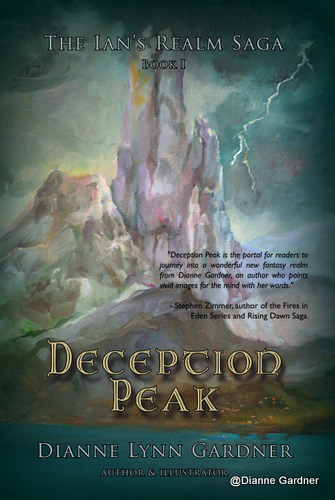 Check out this trailer for Deception Peak. Dianne is also giving away a copy of the book on Goodreads. Make sure and stop by Dianne’s blog and don’t forget to subscribe while you’re visiting. She has giveaways, updates, information on book signings and other things to help you pass the time. Make sure and tell her I sent you over. Awesome interview, Tony! Thank you for having me! I admire you and several of the other Hydra authors who are artistic in a number of fields–how you find time for it all I don’t know! Well done. Dianne, you did all the heavy lifting. Thanks for giving people a glimpse into your world.